Only about a dozen notes like this are known to exist. 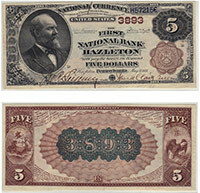 A bank had to be a territorial, opened between 1888 and 1901, and still be in operation after 1908 to issue these notes. And even then, some banks didn't print the $20 denomination. So these are definitely oddities. Please contact us if you would like to know how much yours is worth. Don't forget to check the serial number. Number 1 notes always sell for nice premiums.